Dubai: At least ten UAE expatriates woke up to a pleasant surprise on Tuesday after hitting the jackpot in Dubai’s million dollar lottery draw. 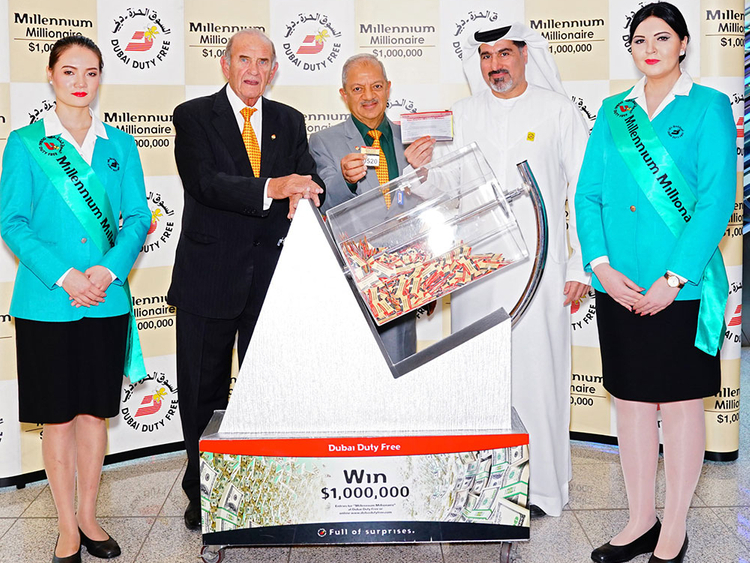 At least eight Indians, one Syrian and one Filipina had earlier pooled together their funds to purchase a ticket for the Dubai Duty Free Millennium Millionaire draw. Just today, their coupon was picked as the winner for the top prize of $1 million, so each of the expatriates will be bringing home approximately Dh360,000. “Buying a ticket to win $1 million has become a habit for us in the company. We are delighted to have finally won and can call ourselves lucky people,” said Nowshad Subir from India, who purchased the ticket. “Our win makes us feel more secure, so thank you so much Dubai Duty Free,” Subir added. Three other Dubai residents have also found themselves lucky, as they will be driving home some luxury vehicles, according to Dubai Duty Free. Khalifa Abdulla Harib bin Harib Al Falahi, a 60-year-old UAE national, won a Mercedes Benz S560, while another resident, Farhan Shaukat, a 43-year-old expat from Pakistan, won a Porsche Cayenne S.
“I still can’t believe that I won a car with a ticket I bought online... I will continue to participate in the hope of making it second-time lucky,” said Shaukat, who has been a resident of Dubai for nine years and works as a programme manager. The third lucky resident is Parveen Sheikh Asif, a 43-year-old Indian national who will be driving home a BMW R 1200 R motorbike.